Bus from Singapore to Cameron Highlands is a popular holiday bus route in Singapore, especially for nature lovers and family travellers. Family travellers like to spend their vacation in Cameron Highlands during school holidays because of the natural scenery, cooling weather, charming tea farm and interesting experiences in the strawberry farm. The One Travel and Tours and Starmart Express are the only operators serving bus from Singapore to Cameron Highlands. The fare for the bus to Cameron Highlands is at SGD 50.00-SGD 51.50 per ticket and may vary with seasons. 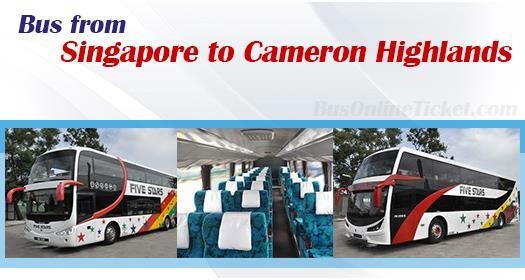 The duration required for bus from Singapore to Cameron Highlands is about 9 hours depending on traffic conditions. The One Travel Fivestar Express coaches depart from Golden Mile Complex at Beach Road daily at 10:30 pm and terminate at Copthorne Hotel (Cameron Highlands), Brinchang Hotel, Heritage Hotel, and Strawberry Park Resort. Meanwhile, Starmart coaches depart from Golden Mile Tower at 10:15 pm and from Boon Lay Shopping Centre at 11:00 pm . Starmart coaches terminate at the same arrival points as The One Travel coaches, with the addition of Tanah Rata Bus Terminal and Cameron Highlands Resort. 2 Washroom breaks will be provided during the journey. In the past, the coaches will go by the Tapah old mountain road to Cameron Highlands. Hence the coaches will stop by towns like Ringlet, Tanah Rata, and Brinchang in Cameron Highlands before terminating at Equatorial Hotel. With the new and better road condition at Simpang Pulai mountain road, The One Travel Fivestar Express coaches have changed to using the Simpang Pulai mountain road to go to Cameron Highlands. There is no counter service at Copthorne Hotel, Cameron Highlands. Therefore, travellers are advised to book their return ticket in advance for the bus to Cameron Highlands in BusOnlineTicket. Booking ticket in BusOnlineTicket.com is simple and easy as long as you have a credit card and the Internet with you. Confirmation of tickets is instant in BusOnlineTicket.com. This ensures travellers will secure the bus ticket for their wonderful trip in Cameron Highlands.